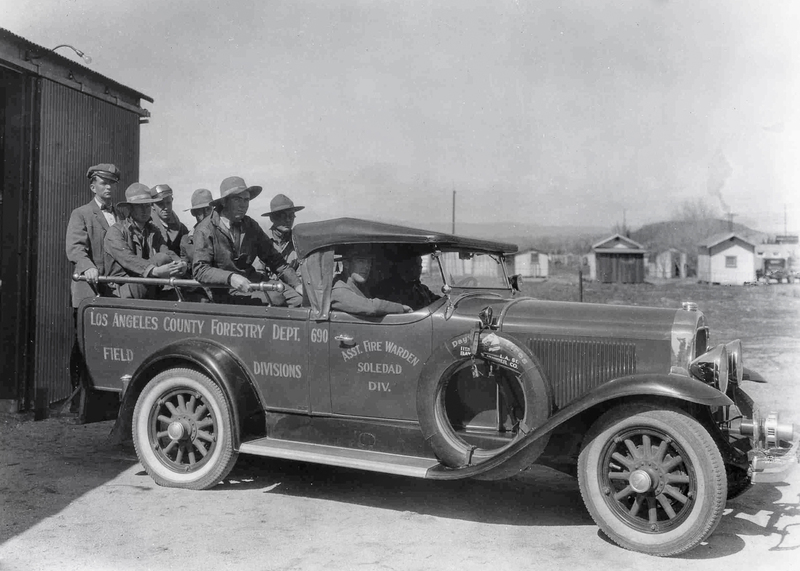 1929 Buick squad truck, assigned to the Assistant Fire Warden for the Soledad Division of the L.A. County Forestry Department. It's parked at the department's Soledad Division Headquarters at 1457 San Fernando Road in Newhall. The assistant fire warden was the equivalent of today's battalion chief. The Soledad Division was initially responsible for a 1,000-plus square-mile territory stretching from Santa Clarta Divide on the south to the Ventura, Kern and San Bernardino county borders on the west, north and east. According to Brunner's 1940 history, the headquaters building, where this truck is parked, was erected during the winter of 1928. The building is gone, but according to Station 73 Fire Capt. Paul Peppard (2014), the corrugated steel barn, seen at left, is still there — although it's been stuccoed over and re-roofed. The corrugated metal siding can still be seen from inside, Peppard says. FD2901: 19200 dpi jpeg from jpeg courtesy of Fire Capt. Paul Peppard, Station 73, Los Angeles County Fire Department, 2014.